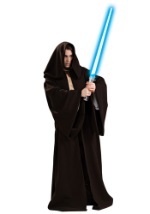 You will look just like Star Wars' tragic hero Anakin Skywalker with these vinyl boots. The boots feature a thick rubber sole for traction and comfort while traveling the galaxy. Three straps accent the boots and hold the front removable piece in place. A zipper run the height of the boots for easy removal. Navigate the full spectrum of the force with these Anakin boots.